What Does a Frenchman wear under his Sarong?! Most people know what a traditional Scotsman wears under his kilt*. But far fewer people know what a Frenchman wears under his sarong! I’d never given this tragic gap in my knowledge any consideration whatsoever – I mean, who associates Frenchmen with sarongs? But if this vexed question HAD been keeping me awake at night, I certainly wouldn’t have expected to find the answer on top of a mountain overlooking the gorges along the Charles Knife road south of Western Australia’s Exmouth! 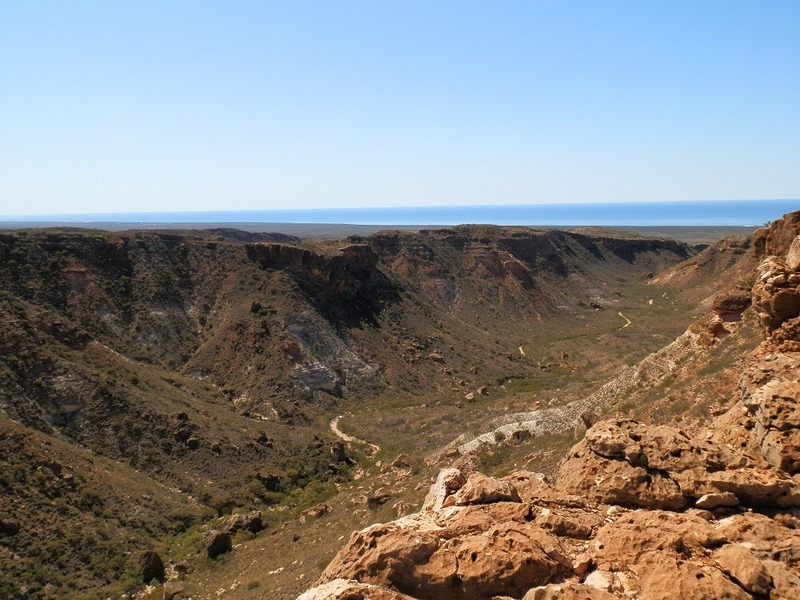 Although perhaps the narrow peninsula of the North West Cape with its own ecosystem and weather patterns, and the amazing diversity of the World Heritage Ningaloo Marine Park and Cape Range National Park invites the unexpected. And in stark contrast to the magnificent western beaches and gorges, we certainly didn’t expect the scenic grandeur of the Cape’s eastern lookouts, scattered along the narrow, rocky, dusty, steep and horribly exposed ridge-top road of the Cape Range anticline. A road WAAAAY more suited to a Land Rover 4WD than a more conventional vehicle like ours. And even less to the van struggling up the incline behind us as we carefully negotiated the narrow, single lane on the knife-edge ridge! With ‘Tracy’ emblazoned on the bonnet, and its three occupants in classic feet-on-the-dashboard travelling pose, it closed the gap between us and pulled out to overtake. Strangely unwilling to take part in a random murder/suicide pact with Tracy’s unknown (to us) occupants, Pilchard sped down the middle of the road with the van in hot pursuit. But finally, superior tyres, aerodynamics and handling won out and we pulled away. The rough, rugged and rocky track to the final lookout had deterred the less adventurous, but a deserted combi van painted all over with symbols and random Australian place names had made the trip before us. Looking around, it became apparent that without an 8km hike, the magnificent views from the road below would not be matched at THIS spot. As we searched in vain for a better lookout spot, two figures emerged from the rugged rocky area below the track. The leader, saronged, shirtless, tanned and dreadlocked greeted us in perfectly broken English. ‘Did you walk to the lookout?’ I asked, taking in the bony outline of his clavicles in that twilight zone somewhere between ‘lean’ and ’emaciated’. He smiled and gestured to his bare feet. ‘Non, madame. I have not the shoes,’ his beautiful accent a clear indicator of nationality. Of course. What was I thinking? A barefoot hiker clad in a sarong – and a ‘do rag’ holding back the dreads?? His taciturn companion, also shirtless, but terminally cool with trousers slung so low his family jewels were in serious danger of being rendered useless by the spinifex and thorny shrubbery at the exact right height to do serious damage, lurked behind looking disinterested. Perhaps we were too old and/or unfashionable to be worthy of his consideration. Or maybe he didn’t speak English. Noise erupted behind us as Tracy pulled into the carpark. Low pants slunk off towards the combi. ‘Is the lookout far from here?’ I asked, wondering what exactly Sarong man and Low pants had been up to in the cave. ‘We did not go there,’ he replied, teeth white against his tan. Noise erupted behind us as Low Pants and Tracy’s occupants greeted each other in the manner of explorers in a land of aliens discovering they are at last amongst their own kind. Celebrating their new friendship with a blast of rap music gave us our cue and we turned to leave. * Click HERE if you’re still in the dark! Previous Post: 1000 Words about … Clouds! « 1000 words about … CLOUDS! @Alessandra – I wish they were!!! @FruitCake – I tried to write the accent phonetically, but it just looked silly!! And yes, somehow the whole outfit – and situation – seemed purpose built for a cosmic combi! We actually saw it a few times as we headed down the coast, but Mr No Pants was never around! @Kath – Stylish Frenchmen? How dull!!! Actually, I wasn’t sure I could even compute a sarong-wearing Frenchman until I saw it for myself. Sadly, the lack of photographic evidence means the less trusting won’t believe me! @ruma – So great to hear from you, my friend! Have a good day!! @Fun60 – Just tell me how to get a pic in that situation and next time I’m there!!! @Iris – Sorry you missed all the fun … and Mr No Pants told us he was going to Coral Bay too!! No sign of your lens … but I was distracted by other things!! Have a great day!! @MJWC – Pilchard & your husband have a lot in common … I couldn’t believe they were oblivious to the sheer cliffs on each side of the road!! @Indrani – I saw just enough, I think!! Any more & I’d be blushing! @River – Well … I guess you can get ‘lucky’ in all sorts of random places … your vision of the beach is a perfect one!! @Jane & Lance – Sadly or happily (depending on one’s point of view) there was only one Frenchman and one sarong!! Perhaps it’s the ONLY sighting EVER of a Frenchman in a sarong??!! @TMWH – Haha, I suspect ‘exploring’ wasn’t actually what they were up to!!! Would love to see your comparison pix sometime!! @Filip & Kristel – Thanx!! It’s one of my favourites!! @Beach Bum – haha, that’s a great name!! Although I suspect the downunder version might be a little more ‘descriptive’!! @Windsmoke – Haha! I’m still wondering what he expected my reaction to be to the no pants thing!!! @Dianne – I know, I know … but I couldn’t work out how to do it without being misinterpreted!!! Uiiii. LOL, too funny, can really imagine that scene! Never saw that beauty, though! Just stayed overnight and went to Coral Bay straight. Walks are always enhanced by meeting some freaks on the way. No pants? I think he’s carrying on a bit, as surely a sarong is more than enough for a day hike?! Actually, all one needs is a footy sock and the job’s done. Right?! I searched in vain for a photo of low pants and sarong French man. How could you tease us with such a wonderful story but no photo? It’s a bit of a worry, isn’t it? You’ve just got to hope that they don’t wander off and get lost without any decent equipment. Funny too, that we don’t see any sarong wearing Frenchmen here in Geneva – just stylish ones in fancy suits and Rolex watches! Over the years I have conducted my own informal survey of scots wearing kilts, and was convinced the only acceptable response to the question “what have you got under your kilt?” was “take a look”. Despite Wikipedia’s assertion that not wearing anything under a kilt is a childish and unhygienic practice, I should imagine that for many hundreds of years underpants under kilts were unheard of, unaffordable, and certainly unnecessary in a climate not likely to cause prickly heat. A painted combi van, on the other hand, is the appropriate accessory with which to complement an outfit of dreads, sarongs, and lack of thongs. Ze oxong only adds to ze allure, non? It’s beautiful scenery, but not really the type of area you’d expect to find a half naked Frenchman with no shoes. The beach at the tip of North West Cape looks perfect for lazing back with a blanket, a book and a bottle of water for a few hours. Well that beats the pants off any story I have this week. Photos would have been nice, but I can understand why you would not bring your camera out. It sounds as if Monsieur Sarong was hinting at you giving him or paying for his shorts and shoes. Nice to see Mr Roo in his native red habitat. Whew!! Sounds like you had quite an experience starting with the Tracy van behind you. My Hubs would have been swearing a blue streak if that happened to us. You sure did get some great shots. What a laugh Red … but you didn’t snap their picture!! Bonza photos. Some people really don’t have a clue “I have not the shoes” and probably not much else either. During my time in the American southwest while I was in the army I was introduced to something similar. We called it the “Jesus Christ plant.” Why? Because what said was after you bumped into it while walking around at night was Jesus Christ that hurt! The 2nd shot is great. Ah, the French! They do seem to underdress for some adventures! I wonder why those two felt apprpriately attired for visiting caves? Seems to me that environment would pose a serious issue for sarong wearers! Gorgeous photos– reminds me of parts of West Texas. Well, life is certainly never dull whenever you are around, let alone Frenchmen in sarongs [or was that just one Frenchman and a single sarong? ]Sadly, it does not seem ‘de rigeur’ for Frenchmen or indeed men of other nationalities to be walking along Andrassy Boulevard in Budapest dressed as they clearly are on the Charles Knife Gorge down under. More is the pity say we for we are all for spicing up the everyday life. Still, if we are serious about adding zest to the everyday, then clearly we must tag along with you both….but would the excitement be too much, we ask ourselves? Wonderful scenery by the way! !